He made international headlines in 2017 when he installed a piece of art at the demilitarized zone between North and South Korea, and the year before that when he painted an homage to garbage collectors across more than 50 buildings in Cairo. But eL Seed is not new to making images that span, cross, and bridge borders. 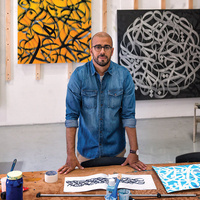 The French-Tunisian artist’s form itself is a bridge between the traditional art of calligraphy and the contemporary language of graffiti. Inspired by the Arab Spring to produce large-scale public works, eL Seed has placed images based on Arabic calligraphy throughout the Middle East, Europe, and Latin America, activating text and public space to explore identity, perception, and our shared world. In a dynamic lecture interweaved with images, eL Seed will take you on a visual and philosophical journey through the complex political, social, and cultural landscapes in which we live. Linda Komaroff, curator of Islamic art at the Los Angeles County Museum of Art (LACMA), will moderate a post-talk Q&A. Linda Komaroff has served as LACMA’s curator of Islamic art since 1995. Her exhibitions include Gifts of the Sultan: The Arts of Giving at the Islamic Courts (2011) and Islamic Art Now: Contemporary Art of the Middle East, parts 1 and 2 (2016-2017). She is the author or editor of several books and exhibition catalogues, and has written numerous articles and book chapters on Islamic art. Presented by USC Visions and Voices: The Arts and Humanities Initiative. Organized by Sherin Guirguis (Art and Design), Renee Almassizadeh (Middle East Studies), and the USC Roski School of Art and Design.